1968 Mustang "High Country Special"
Thank you for checking out our webpage. This page is sponsored by KR Performance & Restorations, LLC and Rupp Restorations. 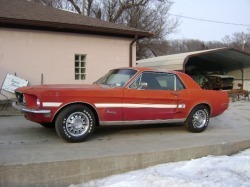 Together, we will be detailing the restoration process of Marty Rupp's 1968 Ford Mustang High Country Special. As many of you know, projects themes and goals can change throughout the process. But at this point, the plan is to restore this car to be a nice driver, maybe even to concourse driven standards. Follow along as this car is restored to "like new" condition! If you have any questions about anything you see on this site, please feel free to drop us an email to info@krpandr.com. Thanks and I hope you enjoy! Contact Us. Let Us Know What You Think!